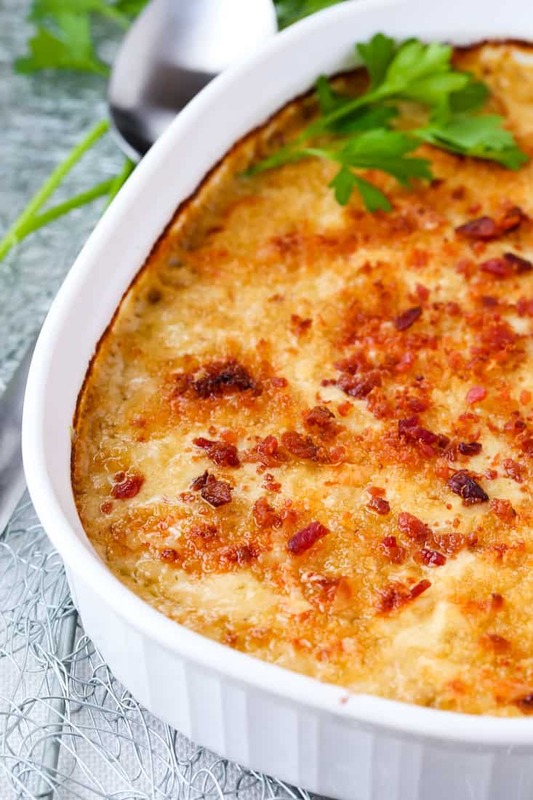 Creamed Spaghetti Squash with Bacon and Gruyere takes just a few minutes to make and is the perfect side dish to your holiday turkey or roast! We’re on day 3 of side dish week and you guys are going to have to sit down for this one…this Creamed Spaghetti Squash with Bacon and Gruyere is the holiday side dish to end them all! Not kidding here guys. This is the side dish recipe to end all side dish recipes. 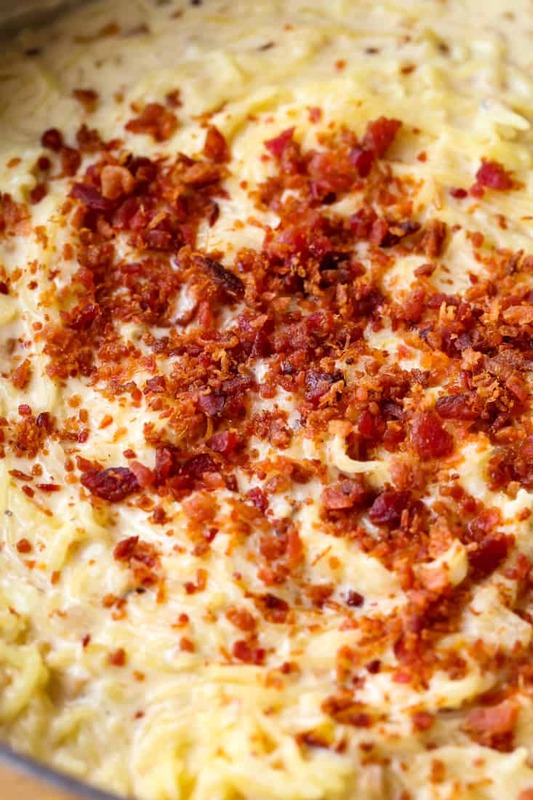 The flavor of gruyere cheese and bacon in a creamy sauce with spaghetti squash…literally unbelievable. We started out side dish week with a “how to” for you guys. How To Cook Spaghetti Squash is a simple, easy to follow instruction guide for cooking this ever so popular squash. And then I had to come up with a new recipe to make with it. I started thinking about the holidays, Thanksgiving and Christmas and what people make to go next to their turkey and prime rib roasts. One thing I though of was creamed spinach. Classic side dish recipe that goes so well with beef or poultry…but what if spinach isn’t you’re thing? Even in all that creamy sauce, creamed spinach is still – well – spinach. 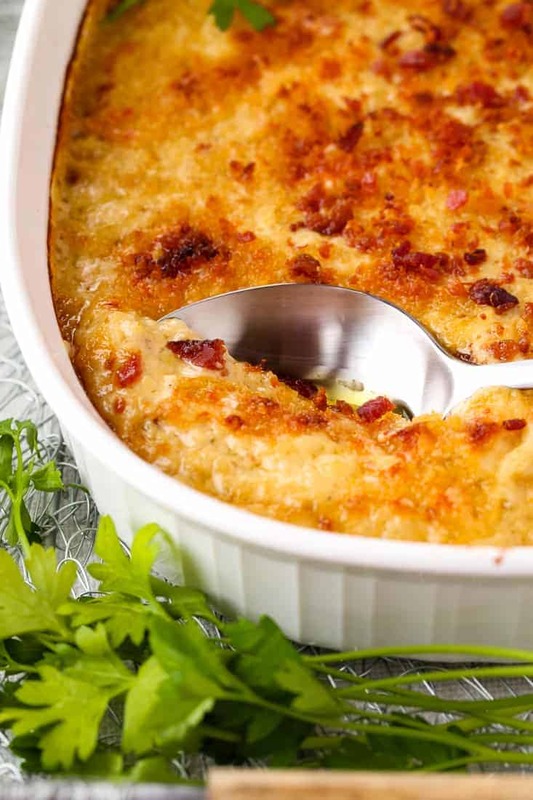 So if you like all that creamy side dish goodness going on but want something a little different, then this Creamed Spaghetti Squash with Bacon and Gruyere is IT. Also this is a make ahead side dish recipe so you’re good to go there. 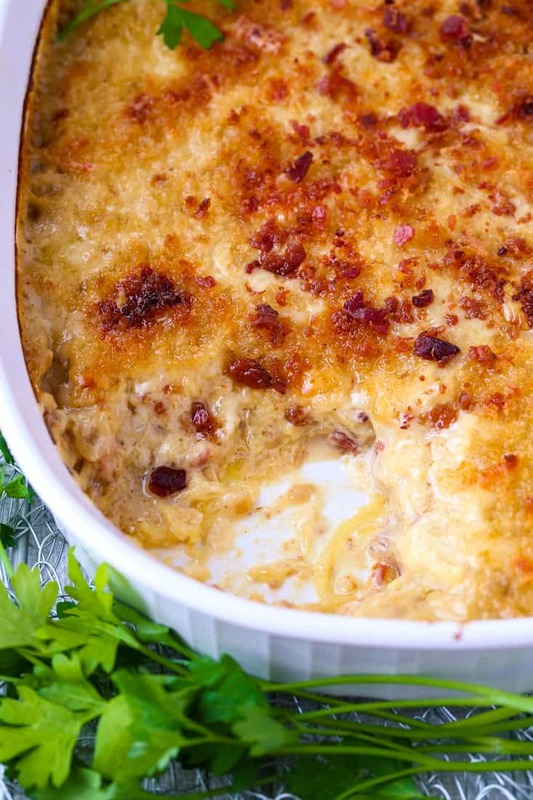 Just have this spaghetti squash gratin ready to go and pop it in the oven when you’re ready. One less thing to have to worry about for Thanksgiving dinner or ANY dinner really. What Can You Serve Spaghetti Squash With? 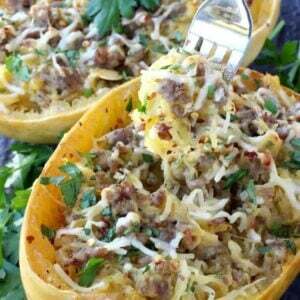 This spaghetti squash recipe, and most spaghetti squash recipes, are going to go perfectly next to a big steak dinner, any type of chicken dinner or even on it’s own! This side dish recipe in particular is going to be that that decadent Thanksgiving side dish everyone is always looking for, right next to you turkey. To make this Creamed Spaghetti Squash with Bacon and Gruyere, start by cooking the spaghetti squash in the oven. Next scrape out all the flesh into strands and put the squash in a bowl to hang out while you make the sauce. This sauce you guys. Creamy, cheesy, ridiculous sauce that you could use as a base for so many different recipes…like creamed spinach for one. Stir spinach in here instead of spaghetti squash and I think it would be the best creamed spinach recipe ever. To start the sauce we’re going to get onions and garlic going in a skillet with some butter. Add in flour and more butter to make a roux to thicken the sauce, then pour in heavy cream. Once the cream sauce comes to a simmer you can stir in the gruyere cheese. Gruyere is a nutty, milder form of swiss cheese – which I am not a fan of – so even if you don’t like swiss cheese you should try gruyere. 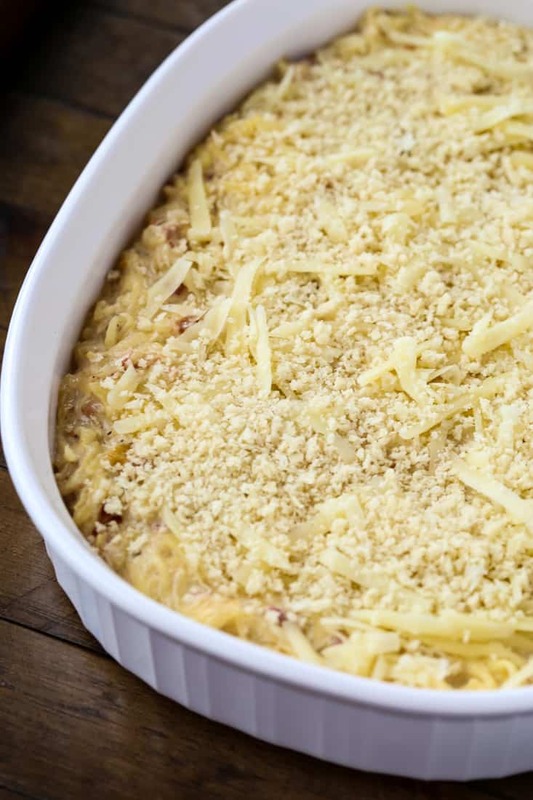 Gruyere really gives this spaghetti squash casserole an amazing flavor, but if you do want to swap it out for another cheese I’d suggest a sharp cheddar or regular swiss cheese. Here’s another thing about this recipe…the bacon. I used bacon bits instead of regular bacon. Why? Well for one its a lot easier and for two I actually think in certain recipes it tastes better. Yes you have to get the REAL bacon bits, they’re a little more expensive than the fake kind obviously but definitely worth it. We keep bacon bits in the refrigerator for lots of things like making eggs or mixing into some chicken salad. Because bacon makes everything better, even bacon bits. Ok back to the spaghetti squash – mix the cooked spaghetti squash into the cream sauce then pour it all into an 8″ x 8″ baking dish. Top that with more cheese and panko bread crumbs and get it in the oven to bake. 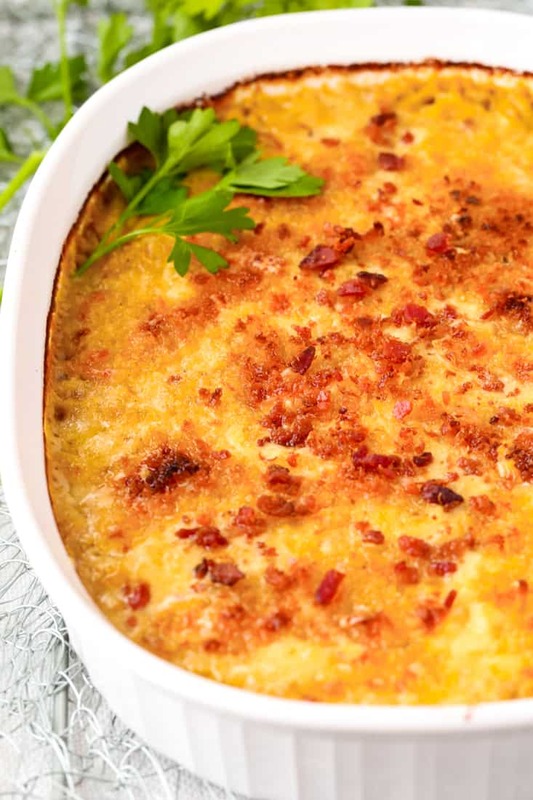 When this Creamed Spaghetti Squash with Bacon and Gruyere comes out of the oven it’ll be bubbling and browned on top and you won’t be able to wait to dive in. But before you do…get a few more bacon bits on top there and then serve. This is the side dish to end all side dishes! A decadent, creamy spaghetti squash side dish that will go perfectly on your holiday table! Add 1 tablespoon of butter to a large skillet over medium heat. Add the diced onion and cook for 3-4 minutes, then add the chopped garlic and cook for 2-3 minutes longer. Place the other tablespoon of butter into the skillet and add the flour, whisking to combine with the onions and garlic. Cook for 1 minute, then slowly whisk in the cream and chicken broth. Add the salt, pepper and nutmeg to the sauce and stir. Bring the sauce to a simmer then add the gruyere cheese, whisking to combine until the sauce is smooth. Add the cooked spaghetti squash and bacon to the cream sauce, stirring to combine. 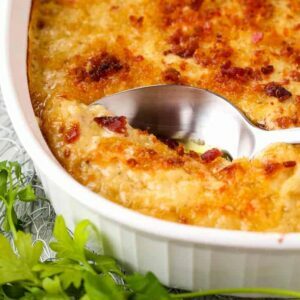 Pour into a shallow gratin dish (about a 1 quart size) then top with the remaining 1/2 cup of cheese, bacon and breadcrumbs. Bake for 25 minutes until bubbling then remove from the oven. 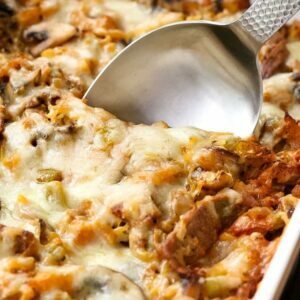 Place the baking dish back into the oven and broil for 4-5 minutes until the top of the casserole is brown and crispy. Remove from the oven and top with the remaining bacon bits. You can use real bacon that’s been cooked and chopped finely instead of bacon bits. I prefer to cook this recipe in a 1 quart, shallow gratin dis but an 8″ x 8″ baking dish will work also. If you need to double this recipe you can easily do so and cook in a 9″ x 13″ baking dish. Cooking times should be approximately the same.